Great! Wonderful! So many ideas. I’m glad I’m putting on the 8yards. I’ve never thought about division of space, nor the use of Fibonacci in the way you’re showing us. Thanks! So I finished the squared sample and sixth towel on an 8 yard warp last night. They’re in the washer now. Enough left for a scarf or table runner. About to re-sley at 12epi and realized I’m going to have to move my shaft cords. Math… not my strong suit. Lol. I think I’ll go shop the stash for weft first. That’s more fun. Oh my gosh, this is so much fun I can’t quit smiling! 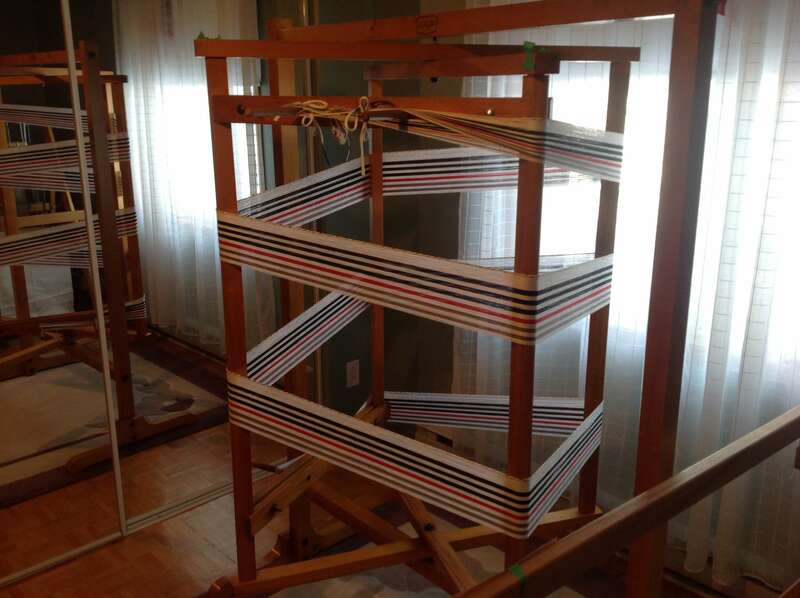 For 25 years I’ve been weaving saddle blankets on a monster Cranbrook 12 harness, 60 inch loom. I use hand spun wool, threaded at 6 epi and beat HARD at 18-20 ppi. Imagine the challenges I’ve had going to a smaller loom using 8/2 cotton 18 epi, 18 ppi! I really had to practice a soft beat and I was making terrible selvedges because I am used to making a large bubble, or angle, at my fell line. Today it all came together and I am loving this. THANK YOU, JANE! I’ll post pictures when I get further along. 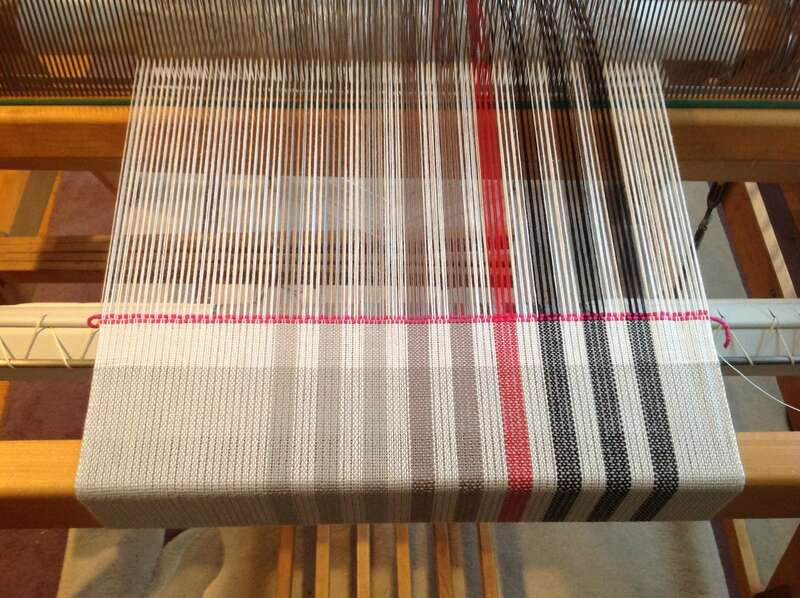 So excited – have to get this off the loom so I can get started!!! I used this big Leclerc floor mill for the first time (borrowed from my sister) after watching a few times Jane’s Online Guild Episode 1.5 Warping on a Floor Mill. Everything work out well and I am happy with the result. Is that the big Leclerc warping mill? That is what i have and I love it! In these last few days since receiving this month’s video I have watched each episode at least two times and some three. Today I ran to my warping mill after seeing a towel I REALLY liked and started winding up a storm. It is hard to contain myself with all the possibilities of designs shown. Wowee! I was watching Episode 2.2 and around about 35 minutes my brain exploded and I had to take a break to find the pieces. Thank-you! I’ve only been weaving a few years, and this episode was exactly what I need to take the next step. I have a journal I’ve been saving for “something” special, and I can’t wait to start using it for my designs. Looking forward to this season and trying the samples. 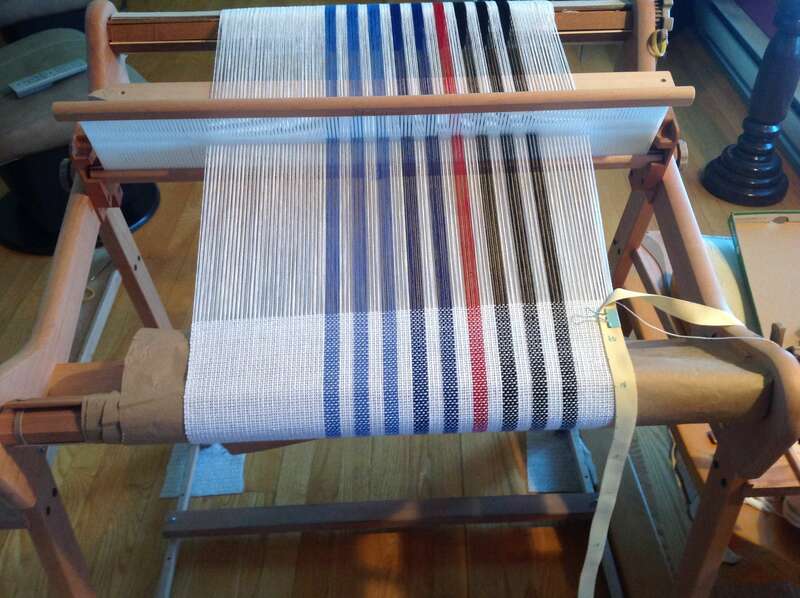 I could not wait to start the Asymmetry sample and used my stash on my 24″ rigid heddle loom (last photo) with a 3 yards warp. I decided not to do a sample but go ahead with dishtowell. 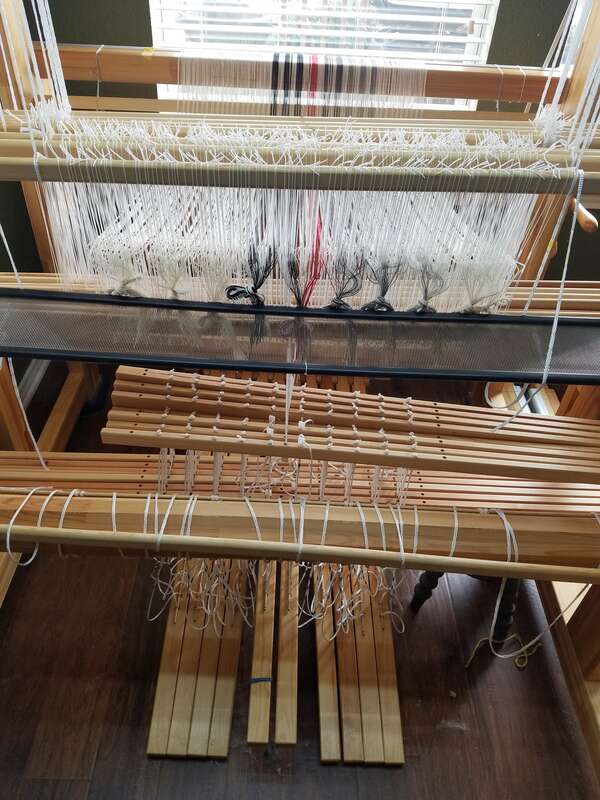 I also set up an 8 yards warp on my Leclerc Inca 4 shaft loom as soon as I received the kit. 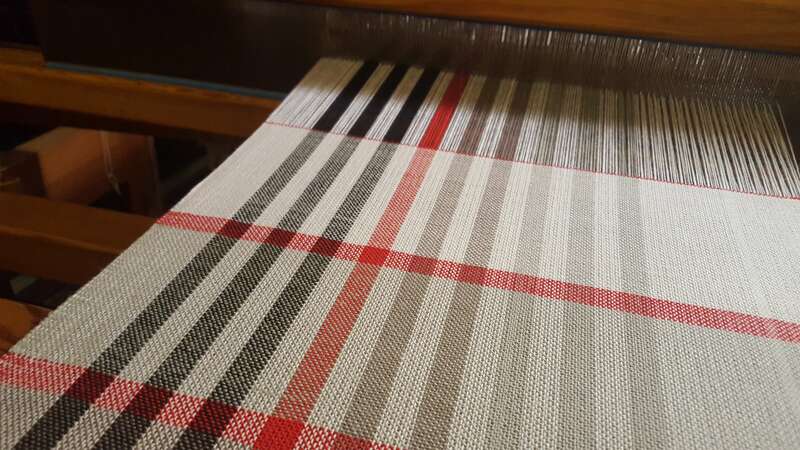 I wove one 32 inches towell with 1/3 black, 1/3 dark grey and 1/3 light grey, really enjoy this experience.